Two more regions and one state will implement smoking-free zones this year, which ban smoking in public places, U Than Sein, president of the non-governmental People’s Health Foundation, said. U Than Sein said that the three regions that will join the no-smoking campaign are Ayeyarwady Region, Bago Region and Mon State. The campaign will be implemented in collaboration with the regional and state governments. “When we set up smoking-free zones, we have to identify and publicise the places where smoking will and will not be allowed,” he said. 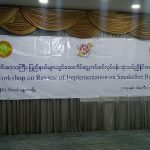 Last year, four regions – Yangon, Mandalay, Sagaing and Magwe – as well as Shan and Kayin states implemented smoking-free zones in a bid to minimise tobacco use. “Some of these regions and states are making headway in the campaign, while others are still trying,” said U Than Sein. Yangon Region is expected to designate smoking-free zones throughout the area in 2022. Initially, it designated smoking-free zones in Kyauktada township this year, he said. “There are 144 places in Kyauktada township where smoking is prohibited according to law. We discussed this with the township administrator and other departments,” U Than Sein said. The foundation is collaborating with the Ministry of Health and Sports to reduce the use of tobacco, including smoking, in the country. “The rate of smoking and betel chewing is still high in the country. We are trying to educate people about the danger of tobacco use. Although, the Tobacco Control Law was enacted in 2006, there are many challenges and weak points in implementing the law,” added U Than Sein. According to the Tobacco Control law, hospital buildings, offices and compounds, medical treatment centres and clinics, teaching buildings of universities, degree colleges and institutes, classrooms and offices are no-smoking areas. Myanmar has been selected as one of 15 countries worldwide to receive dedicated international support from the United Nations through the “FCTC 2030 project” to accelerate implementation of the WHO Framework Convention on Tobacco Control, the Ministry of Health and Sports said in a statement on Tuesday. The project aligns with the 2030 Agenda for Sustainable Development, which includes explicit attention to tobacco control. According to a 2014 survey, the rate of tobacco use in Myanmar is 26.1 percent of the population, including 43.8pc of men and 8.4pc of women. About 80pc of smokers use tobacco every day, about 7pc of students smoke, and 17pc use cigars or other forms of tobacco.